He excelled himself in Obedience, Working Trial, Herding, Agility, Flyball and Dash 'n' Splash. 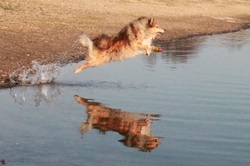 He has been in some major finals and Crufts in Agility and competing in the International level in Flyball. He has also prove that he has the herding instinct as a sheepdog. Sing is also making history in Dash 'N' Splash. 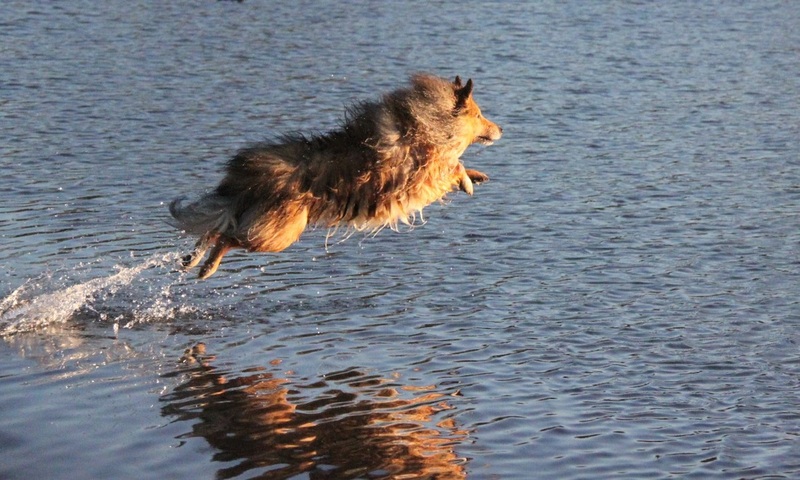 To my knowledge, he was the only sheltie that has competed in Dash 'N' Splash. His first debut was in September 2009, he was 7.5 years old, first dive was 17 feet! That's a long way for a small compact body. Sing has to retire from all his activities in 2010 due to an unknown injury. We didn't know how it happened but on one evening in 2008, he suddenly screamed in pain while we were playing ball. He was then unable to climb the stairs or even jump onto the sofa. He was checked by the vet and prescribed with anti-inflammatory and rest. Although after sometimes off, he was never the same again. He limps from time to time and in early 2009, his left front paw changed shape overnight. I rushed him to the vet but my vet reassured me there is nothing wrong with it. I wasn't convince but I have no idea what to do or how to help him, so more rest for him. The same year August, we went to Scotland on little holiday. Sing was once rushed into the local emergency vet because he was limping so badly that he couldn't walk. The vet examined him and told me that he thought the must have been some foreign body that lives in the "paw". He told me to have him xRay when we get back home to our own vet. When we got home, I changed vet immediately. I got recommended a good reliable veterinary by a good friend of mine. They understand Agility dogs better. Sing had his xRay and immediately followed by a little incision to clean the paw. The vet surgeon took out whatever they think is suspicious and sent them to the laboratory. The vet did confirmed that there were some foreign body in his paw, it could be grass seed or anything agricultural that could lives inside the bloodstream. Sadly, it has gone too far into his bloodstream. There is nothing they can do to bring back the old good paw but what we are doing now is to prevent the paw to get worst. I've been putting sock on the paw everytime we go out walking, in the hope that it will help ease the pain/uncomfortable away for him. Sing is a very tough little dog, nothing stopping him from enjoying life to full. He's still full on when he sees the ball. He is an absolutely ball mad and I am happily to report that he has passed this ball mad to almost all his offspring. Sing has sired some wonderful puppies, he passed on his good temperament to most of his offspring. He has given me a smashing little son that I was longing for. My dear goldie Sing left us on the 18th of April 2017, he was 15 years old 1 month and 2 days. He left a huge hole in our heart. He was my first sheltie and he taught me so much in the years that he gave all his life to me. He was one in a million. He was the "wind beneath my wing" ... my life is so empty without him.